My oldest son, Thing 1, sometimes gets upset when he realizes that that he probably won’t invent anything that is completely new — as in, no one has ever thought of any part of it before. I try to explain that we if all had to invent the wheel each time we wanted to get to a place or build anything, 99.8% of humanity would still be walking everywhere and living in caves or stick huts. The explanation never seems to make him feel better. Oh well. He’ll have other disappointments in life. Good design totally builds on/imitates what has come before, so I never judge a new space harshly when I get the feeling of deja vu while looking for inspirational images. I, myself, am usually looking for something to imitate as a launch pad for a new design! I take designer deja vu and look for ways to learn. Imitation is the sincerest form of flattery, and I love seeing the creative ways a designer tackles an inspirational idea and makes it totally new for his/her unique space. Also, it’s really fun trying to remember/track down where I saw the original space! Who am I kidding?! It’s like a friggin’ screwdriver in your brain. Like trying to remember where you saw some obscure actor in a movie 10 years ago and can’t sleep for a whole night trying to figure it out! So you can imagine my delight/pain when I came across this kitchen recently. The above is by the talented designer Stephen Saint-Onge and was featured on the blog of Cliq Studios, a semi-custom online kitchen cabinetry company that I’ve worked with. I knew exactly which kitchen it reminded me of, but finding it was another matter. 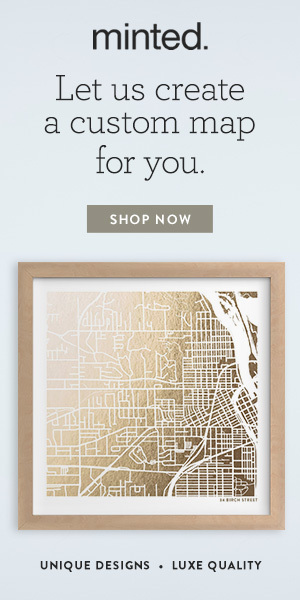 I knew it was from a House Beautiful issue I read from perhaps 10 years ago … before Pinterest really exploded in popularity, so I didn’t know if I was going to be able to find it online or not. After about half an hour of searching, I found it! It’s a kitchen by Megan Rice Yager. House Beautiful featured it in 2010, but I remember it like yesterday! BTW, here are the sink and the faucet. … And, of course, the patinaed-with-use antique set-back hutch and dining table. Back in 2010, we were in our starter ranch house in Nashville. I dreamt of the “forever house,” but I had no idea yet what/where that might be, so I filed Megan’s kitchen away in my memory. I didn’t have any Pinterest pages back then, and I have never been good about keeping paper files. I feel positive Stephen did exactly the same this for his own kitchen. Let’s revisit. Patinaed surfaces (island top), check. But then, of course, he totally put his own twist on this look. An island with storage and book space, with the top made from his former dining table. Hanging posts and vintage tribal runners. Soapstone, rather than granite, counters and an under mount stainless sink. 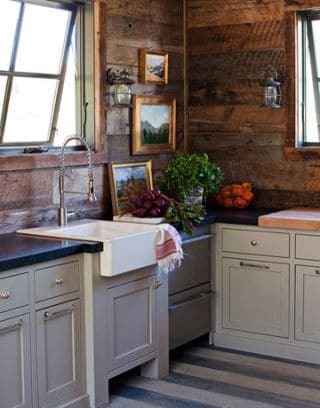 Charming built-in open shelves between the posts and beams. Oranges … not really a design element, but in this weather, we all need our vitamin C! All images of Stephen’s kitchen via Cliq Studios, except this last which is from Stephen’s website. Here’s a “Get the Look” for your pinning pleasure! Can you tell I have kitchens on the brain? The Handsome Husband and I are working through plans with our architect and GC for our own major renovation that will address the 1970s/90s addition to our 1790 house — kitchen/mudroom/laundry/master bedroom/bathroom. I’m tentatively titling it “Renovating a Remuddle on a Real Person’s Budget” — i.e. we’re not bulldozing the addition, like most old-house purists would. We’re beginning in the spring and will have a TON of posts about working through all that. I’ve got tons of inspiration boards and research on products to share with you … just not quite ready yet! What do you think of designer deja vu? Copy cat or sincere form of flattery? 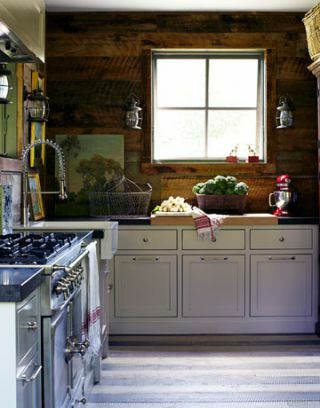 Could you live in a rustic/refined kitchen??? I l-o-v-e this (these, lol) kitchen. Especially this time of year- I don’t think I would be as happy during the hot so cal summers when I just want things as light and cool and airy as possible, but hunkered down for the winter in my desert mountain town… yes. Especially the library dining table! How inviting is that! If only every rental cabin copied Stephen’s copy. Love it! It’s the perfect New Hampshire-rustic-in-the-woods #unkitchen! I can smell all of the delicous aromas and especially the wood burning fireplace during a blizzard! I so enjoyed my son’s fireplace over Thanksgiving at his home in Western Mass. Made me long to have one again. Oooo, yes, a fireplace in the kitchen, how wonderful! A number of old houses around here have them, but sadly ours was muddled away at some point in its history. Out of the probably 7 fireplaces our home once had, only one and another mantle are left. Hi Sandra. I have not yet done a kitchen in Jet (or Vermont or Virginia) Mist granite, but I have seen it in person in 2 kitchens — in one 18th c. and another reproduction home — and I’ve seen it at my stone fabricators. It looks really, really nice. Yes, I would definitely suggest honed.